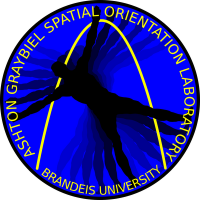 The place - AGSOL - Ashton Graybiel Situational Orientation Lab, at Brandeis University in Waltham, Massachusetts. A group of adults in a basement have been creating rides for decades. What kind of rides? Think amusement park rides without color or sugar coating. Without sun-light or food stands. In this twilight zone several experts research ways to measure, adapt-to and maybe some day avoid this set of phenomena named motion sickness and spatial disorientation. The time - Monday, March 12th 2012 at 9:30am. Paul McCall, a fellow Astronauts4Hire member and I were the second and third people to go through a new 1.5-day protocol designed to give a person wishing to become a commercial astronaut awareness through exposure to motion sickness, spatial illusions and disorientation. The experience can be described as nauseating education, or more aptly, educational nausea. To remove any doubt, I should say right now I am writing these words with great appreciation acknowledging the necessity of this training. This was a revealing experience that would benefit anyone who intends to find himself or herself in a cockpit of a plane, flying on micro-gravity flights or on a spacecraft, and even for other parts of the population, for example those who go on road-trips and tend to get car-sick, those who feel uncomfortable on airplanes and those who go on boats or ships. Obviously, not everyone goes on vacation to a place they will purposefully get dizzy and motion-sick. However, the resulting knowledge of oneself sensitivity, adaptation and decay are useful for anyone except the few lucky bastards who are not susceptible to motion sickness. We started our training with stationary education, going over the vestibular system and the theory behind what we were about to go through. After that it was time for action and motion. 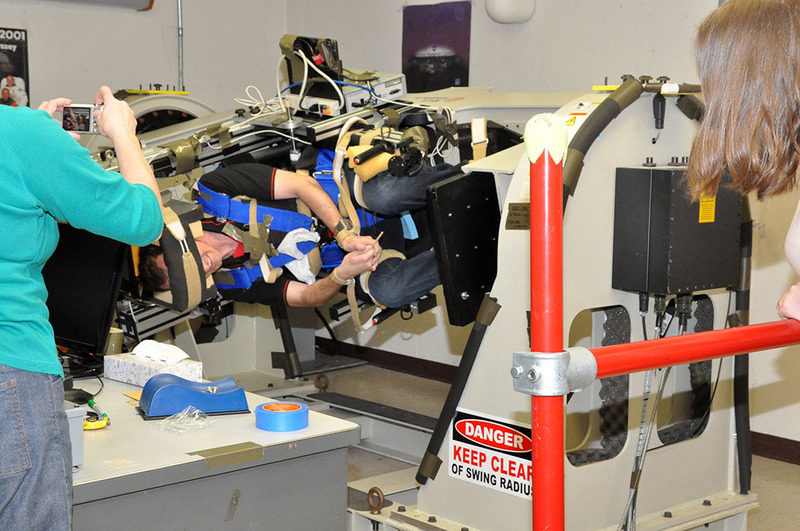 First we were each strapped to the Multi-Axis Tilt Device, which turned us while blind-folded, to show how easy it is to fool the trivial sense of 'up'. It also provided indication to our susceptibility to motion sickness and our individual symptoms that are the onset of motion sickness. In my case, I could feel my stomach, became a little pale and started getting warm and sweating before full onset of nausea after several rounds of two-axis rotation while blind for a few seconds, then stopping and pointing where I thought or felt that up was. Interestingly, in my case symptoms kept piling up even after the motion (or provocation) was removed. We then had lunch (which is good to have when you're feeling nauseated - yes, I didn't know that either...), and went into the Optokinetic Drum, also known as the Vection Chamber. It is a small round chamber with striped walls that can turn, a floor that can turn and also a bar to hold that can turn as well, all of which are independently controlled from the outside. The simplest illusion it provides is that of motion while stationary (vection), similar to the one of sitting in a stationary train with the train next to it moving. In this case the illusion lasts longer and can be influenced by speed of the floor, walls and holding bar. There are other illusions that some people see such as lengthening of the legs. Even when the operator describes exactly what's moving and what's not the illusion persists and the rationale has a very hard time taking over perception known to be incorrect. To better explain the disorienting inversion illusion that may happen in micro-gravity flights or space we wore prism goggles and walked down a corridor. After the first two devices this was even more disorienting. Instinctive stabilization corrections, normally trivial and without error, became difficult as my eyes were providing data that was contrary to the vestibular system. Touching the wall at the lab while walking next to it helped. The last device we went on was the rotating room. It is a 22-foot diameter round room where we were together with researchers, both to see some demonstrations and to experience illusions and Coriolis Cross Coupling effects. The room rotated at 10 rpm (a full turn every 6 seconds). At that relatively low speed, the combined force vector is about 18 degrees from the normal vertical. Any head movement induces the feeling of the room shaking like a boat at high seas. A head pitch movement (looking down) causes a feeling of the room turning vertically and is very provocative (aka nauseating). While the room was turning, we did several exercises that demonstrate Coriolis forces and body adaptation. For example, the simple task of reaching with one's finger and pressing a button initially results with an error of about three inches, but the error is counteracted very quickly and implicitly, as by the second reach the movement is flawless. Walking is a different story as it requires adaptation of the vestibular system, a much harder feat to accomplish. Instinctive stabilization corrections which would normally work fine are a disaster in the environment of the rotating room. Even walking up a small ramp while my back was against the wall was very hard and provocative. The day concluded with another go at the Multi-Axis Tilt Device, this time a different exercise - pitch backward slowly until I said I reached a horizontal position. Then continue until upside down. Then back, going through vertical and horizontal positions. Or at least I thought I knew when I was in these positions. Even though gravity was there to help me and movement was slow and single-directional, without visuals errors were big. My body and its sensors were fooled once eyesight was not there to help. The next day I felt as if I had a stomach flu in the morning. It felt as if when I got up or sat down my head sensation lagged after the actual motion. The reaction of the experienced researchers at the lab was of familiarity - "Classic Symptoms". The short half-day was spent getting a demonstration how standing with one foot behind the other (less stable than normal standing position), even a very light touch of a surface with one finger provides more sensory data to the brain, which helps with the stabilization fine-tuning signals the brain sends to the leg and body muscles. 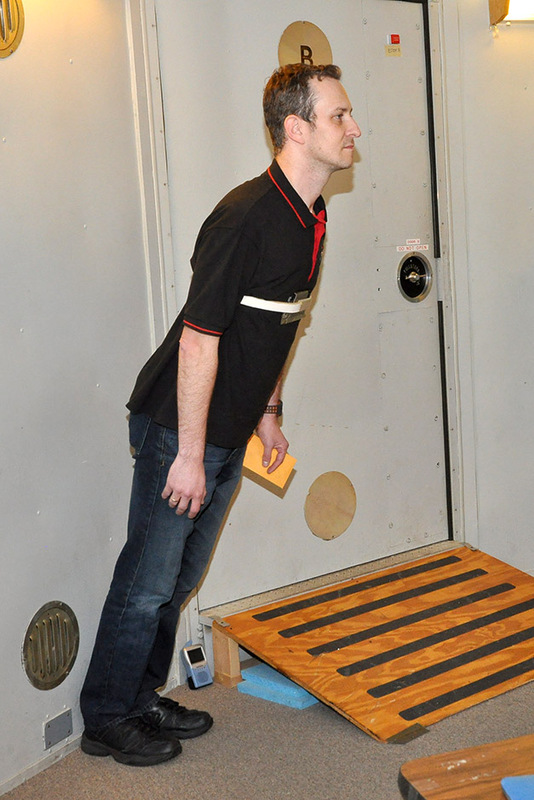 In unfamiliar situations such as micro-gravity or hyper-gravity this kind of technique helps deal with illusions and instability. Paul also did a test to identify his decay factor. I did not go through that test as I was still sensitized from the previous day, which would have skewed the results and not help my situation. It's the transition, stupid! What provokes nausea is transitions between states. If the airplane, car, bus or roller-coaster would go at a constant speed in a straight line without potholes, bumps or air-currents you would never get motion-sick. Continuous turning means continuous transition. Be careful of head pitch-movements. Tilting your head up or down while there's a transition in forces on you (during flight, riding a car, etc.) is the most provocative and nauseating thing you can do (Cross Coriolis Coupling Stimulation). Unless you are not susceptible, you'll get sick quick. If you did tilt your head, no worries. Avoid making more movements and help your brain recuperate by supplying all the situational data you can - look outside if you can and stabilize yourself. Closing your eyes and moving your head between your hands while the car is driving on a hilly road is not a good idea. Eat and drink well. Being well-nourished helps coping with nauseating situations. Being hypoglycemic and dehydrated doesn't help. Feeling nauseated? Eat and drink. Eating and drinking when nauseated helps feeling better faster. Waiting for the nausea to go away first will just make it last longer. Driving a car (or piloting a plane) will make you less motion-sick than riding it. Riding it looking outside will make you less sick than reading a book while riding it. The less situational sensory consistent data feeding the brain, the more you'll get sick.